The opening ceremony was held last night (24 September) in the new Anderson High School. Around 350 people attended the ceremony which began with some live music from Hjaltibonhoga. There were a few short welcoming speeches then guests had a chance to look at some sponsors’ displays over a glass of wine and a lovely chocolate gift from Mirrie Dancers. Ex patron patron Felicity Ford was present with her friend Liz Ashdowne. Felix’ new book Knitsonik Stranded Colourwork Playbook contained the bunting pattern (by Liz) which inspired the Anderson High School’s Maakin and Yakkin to make some bunting of their own. The AHS bunting was on display and was admired by everybody in attendance. Felix and Liz presented representatives of the maakin and yakkin group with two new flags they had made (inspired by the by the school logo). These will be added to the AHS bunting. Shetland Wool Week is nearly upon us and we’re getting ready at AHS. The bunting is coming along nice with only a few more flags to be complete before the bunting is assembled. It will be on display in time for the Opening Ceremony of Shetland Wool Week on Sunday 23rd September. Everybody is welcome to come along to the Taak Your Sock night on Wednesday 26th September to see the bunting and take part in a knit-along with local knitters of all ages as well as knitters from all over the world. The SWW Makers market will also be held in the school on Saturday 29th. The market provides a great chance to meet local makers along with some visiting ones. There will be lots of stalls with some beautiful woolen goods and accessories on sale, many of which are not available in the shops. The Anderson High School parent council, staff and pupils will be selling teas, coffee, cake, soup and bannocks throughout the day in the dining area of the school in aid of the School Fund, so please come along and join in the fun. Take your maakin too if you have a project on the wires as there will be a chance to do some knitting as well. Exciting times!!!! AHS is very excited to be hosting quite a few events at Shetland Wool Week in September of this year. It will be the venue for the Opening Ceremony and the Makers market. On Wednesday 26 September the AHS Maakers and Yakkers will be holding a Taak Your Sock night and it is hoped that we will have many knitters coming along. To mark the occasion, the group have decided to make special AHS bunting. This has been inspired by a bunting pattern seen in the new Knitsonik Stranded Colourwork Playbook by Felicity Ford. Knitters are now at work producing flags that represent every department in the school and it is hoped to unveil the bunting at the opening ceremony. Five pupils took part in the Maakin and Yakkin activities day this year. It was a glorious day with warm wind, blue skies and sunshine so after a good slathering of sun cream the knitters took it outside. A lovely morning was spent sitting in the sunshine, knitting and eating homebakes with a cup of tea. After lunch we all headed out to the Textile Museum and joined a few local knitters and a spinner. There were a few tourists who came along and were delighted to chat with young Shetland knitters and see the maakin belts in use. During a coffee break before Christmas last year, Mr Smith (PE teacher at AHS) got chatting to Mrs Simpson. He said he had been in 60:40 (the indoor training facility) all morning and he was freezing, as he sat rubbing his head and ears. Mrs Simpson asked if he had a Fair Isle hat he could wear. He answered that he had a few hats but didn’t have a Fair Isle one. Mrs Simpson reported back to the AHS Maakin and Yakkin gang that Mr Smith was in need of some Fair Isle and so the hat project began. Blue, grey and orange wool was picked and the hat started with a two by two coloured rib. Mrs Simpson designed two patterns, one with 60:40 on it and the other of a badminton player. Over the next few weeks various knitters added on a row or two to the hat. It even did the rounds at the Taak Your Sock night in March where ex-pupil Alyssa Macolmson and various other visitors helped the hat along. Just before the Easter holidays the hat was finished. There was a presentation to Mr Smith on the first Maakin and Yakkin session back after the holidays – 19 April. He was completely surprised but also delighted with the hat and even stayed on to do a few rows on a Christmas tree just to prove that he was a knitter. Kudos to Mr Smith! The first Tak Your Sock night in the new school took place on 7 March 2018. Seventeen knitters and one crocheter came along on the night and there were some new faces, which is always great. The school library is the perfect place to hold these sessions and everybody was suitably impressed with the new surroundings. The knitting projects ranged from yokes to Christmas trees, fair isle, lace and even somebody knitting using a cut up t-shirt instead of wool! Jessica, who has just started knitting came along with her granny and completed her first christmas tree. Sara managed to finish off her new Icelandic yoke. It was also great to see Audrey Thompson who, with the help of Violet, was working on her lace Scarf. These nights are always enjoyed by all who attend. We are hoping to hold another Tak Your Sock during Wool Week in September which will probably mean we will have visitors from all over the world attending. Can’t wait!! The first Tak Your Sock night in the new school is planned for Tuesday 27th February from 7-9pm. This will take place in the new Anderson High School Library and there will be tea, coffee and tab nabs. There is no fee, but any donations will go towards the group’s funds. Everybody is welcome along with their knitting or crocheting It would be great to see you there! Freya had a very constructive time around wool week. She finished her peerie cat which she made from a pattern found by Mrs Hunter as well as her fair isle phone cover. Rhiannon knitted a headband for her sister Alisha and finished it just in time as it snowed the next day. Millie Laurenson in S1 is new to the group, having just started AHS in August. With the help of her Whalsay Granny, Millie is already an accomplished knitter and finished her first pair of fingerless gloves. These are made from lovely soft wool and we particularly like the fact she’s done fingers in different colours. Alison Risk, a Maths Teacher in the school recently finished a fair isle cowl which she personalised with her name in pattern. Shetland Wool Week was as exciting as ever again this year. Unfortunately for the Anderson High School Maakin and Yakkin group it came at a very busy time as the school was just about to move into the new building. Therefore, the group couldn’t take part as much as last year. 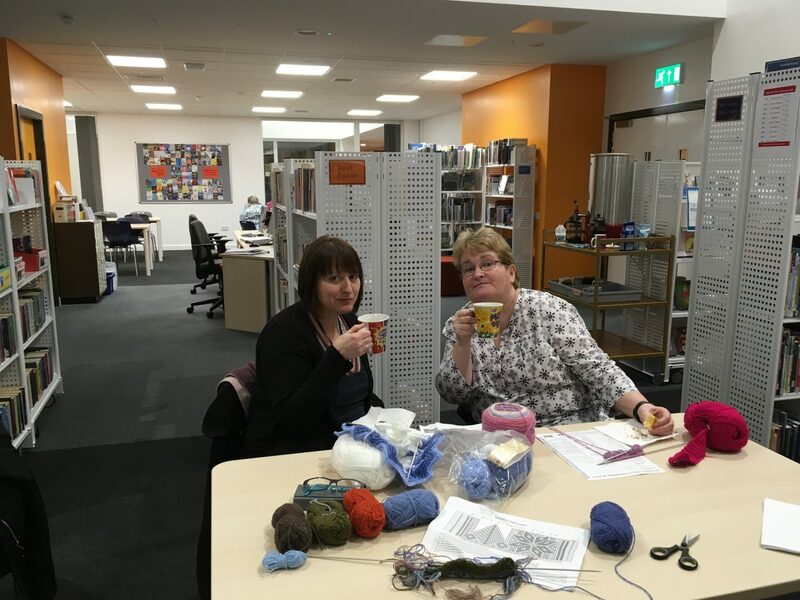 However, that didn’t stop a few keen members going along to the hub in Mareel at nights to knit with some of the visitors and other local knitters. The hoodies caused quite a stir once again, with a few ladies from America asking the girls where they could buy them. Some of the lasses also went along to the Maakers Market on Saturday and bought some wool and other knitting related goodies. Lots of the girls are now proudly wearing their Wool Week T Shirts and have their knitting stored safely in their project bags. Rhiannon couldn’t resist a Langsoond kit and is now busy knitting her cozy Langsoond hat. For wool week 2018 it is hoped that the AHS maakin and yakkin group will be more involved and it is planned to host a “Tak your sock” night in the new school during that week.